It was 1966 and some music had turned the corner. Some music. Frank Sinatra had his strangers and daughter Nancy her boots. The Monkees were believers and Tommy James was hanky panky. The Beatles had released Rubber Soul in 1965 and its songs changed the course of pop musical history. For those who followed the Beatles, like the Pied Piper with the children of Hamlin, Rubber Soul’s direction led to new possibilities. In a month the Beatles released their next album, Revolver. It, too, boosted listeners and believers to new places. A capella is not a phrase associated with the Beatles. The Mills Brothers. The Beach Boys. Not John, Paul, George, and Ringo, but we heard the Beatles do so at the beginning of “Paperback Writer” as they had done at the beginning of “Nowhere Man.” I don’t think most of us realized that. Whether someone actually challenged Paul to write a song that wasn’t a love song and whether Paul saw Ringo reading a paperback at the same time is part of distant misty history. 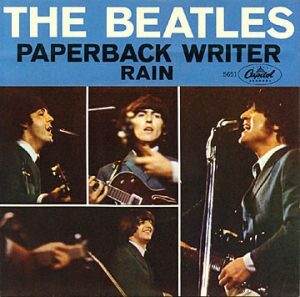 Whatever the inspiration or prompt, “Paperback Writer” is not a love song. It is a (very) short story. The song has a boosted bass. John wanted that. John liked the idea. He wondered why the bass wasn’t more pronounced in earlier work. As Paul sings about wanting to be a paperback writer, the others chant along with the same phrase. Or do they? They certainly do at the end, but what about during the song? It is those playful Beatles singing the words Frère Jacques. Hilarious. The first half is set for pseudo-“a capella” voices in a pattern of cascading antiphony that is something off the beaten path for these guys. The large number of overdubs makes it sound as though many more than just three people were singing; a modest anticipation of what would surface much later in the likes of “Because”. In the second half we suddenly are faced with almost the entire instrumental backing ensemble executing a double-barreled iteration of a really knockout ostinato riff for lead guitar and bass drum; one that I’d say is easily way up in there the same class with the one from “Day Tripper” in terms of both its distinctive melodic contour and craggy syncopations that extend over one and a half of the ostinato’s two-measure length.